The 65" extra large Deep Silver Umbrella from Profoto has a highly reflective silver interior, ideal for producing soft shadows with crisp details. The increased depth of this model allows for more precise control over the spread of the light. Also, it features 16 fiberglass rods for a rounder shape and more even light spread. It is made of heat-resistant materials and the metal elements are surface treated to prevent rust and discoloration. Additionally, this umbrella comes with a fabric carrying bag for travel. 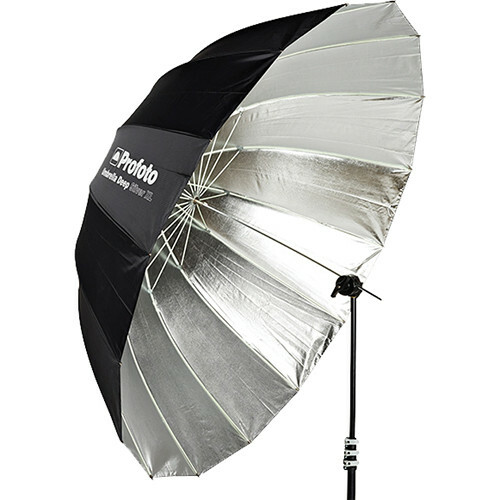 An optional diffuser (sold separately) allows you to transform this umbrella into a softbox. Box Dimensions (LxWxH) 45.1 x 8.95 x 0.03"
Deep Silver Umbrella (Extra Large, 65") is rated 4.3 out of 5 by 6. Rated 5 out of 5 by Anonymous from High quality material and workmanship First time buying Profoto products I had reservations about the higher pricing initially as I have a similar (cheaper) product from another manufacturer. I checked out the XL umbrella locally before making the purchase. It was pretty obvious that the material used and workmanship were much better than the one I was using. There's more curve to the shape of the umbrella as compared to the one I had. Overall, I'm glad I made the switch to Profoto and will probably stick with them for a while. As a side note, this is also the first time I'm buying from B&H and it was a great experience. Enquiries were replied promptly and accurately. I received my products in good condition. The app was useful and intuitive. Great job guys! Rated 3 out of 5 by James Duffy from Great light, but mediocre build quality. I have six of these, and I love the quality of light. But the construction is rather poor, especially for the price. Be advised that Profoto offers absolutely no parts or repairs for these umbrellas. Rated 3 out of 5 by Anonymous from Big, Beautiful Soft Light but Be Careful This umbrella produces a gorgeous light and sets up in a minute. It has several benefits with and without the diffuser. However, the wind knocked down my light (on a C-stand) before my assistant could grab it. This has happened countless times with my Octa's, other umbrellas etc.with no issues. This time, the rod snapped in half and bent into itself. The umbrella was useless after less than hour of shooting. This is great for a studio or indoor shoot with space but be very careful using it outdoors. I like the umbrella so much I bought another after the fist one was destroyed on the first shoot with it. I created a lighting panel with the silver from the destroyed umbrella. Rated 5 out of 5 by Geo from Best umbrella to get. Profoto makes some of the best umbrellas and this doesn't disappoint. Excellent build quality and produces a beautiful light. I use this with a Profoto B1 and like how I can adjust the spread of light by sliding the B1 head along the shaft. I use this with and without the optional diffuser. Rated 5 out of 5 by Geo from Big and Beautiful Best umbrella to get. I use this with a Profoto B1 head. Beautiful light, well made, and I like the adjustable equality of light produced by sliding the B1 on the umbrella shaft. Will this size work on a B2 head? Or does it need a different mount? While it is a large umbrella and I would recommend using a sturdy stand (and sandbags if used outdoors in windy conditions), the Profoto Deep Silver Umbrella (Extra Large, 65 ) uses the standard 8mm umbrella shaft and would slide into the umbrella receptacle on the top of the Profoto B2 Off-Camera Flash. Can I use with profoto HMI 800? Yes, this umbrella is compatible with the Profoto ProDaylight 800 Air. Can this be used with alien Bee? Or do I need a different light source? This umbrella is compatible with many different monolights, including the Alien Bees series. Without the glass dome on the B1, how much of the umbrella is lit by the B1? Is the 65 measurement it's actual diameter, or rib length (over the curve)? Mine measured from rod end to opposing rod end was 65 . I also have a Profoto Deep Silver Umbrella Large and the same distance was 51 . So, in my cases the measurements met with the specifications. Has anyone used this with a B1? It works with the B1 but works best if you have the optional globe that replaces the flat glass on the end of the B1 head. Will this work on a Broncolor Siros 400?